Today's mission was to make friends with what one commenter referred to as "the ugly jumpsuit with magical powers" (please see my previous post). They say (whoever "they" are) that you can completely change an outfit simply by adding different accessories. The addition of a bright scarf, leather belt and cuff and some sandals seemed to cheer it up a bit, and I felt less like a guerrilla solder looking for the rest of my unit. LOVE it. I like the sandals with the jumpsuit and the bright pop of orange. Well done, comrad! So maybe combat boots WOULDN'T have made this better. 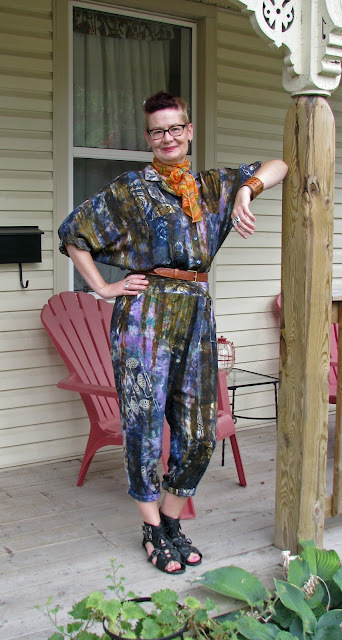 But what you did made a super and funky jumpsuit even BETTER! No surprise. March on! I think that jumpsuit rocks, and may have magical powers. I had to laugh about the guerilla comparison. But now you've got on gladiator sandals. Do you never stop fighting? Kidding. I love the pattern of the orange scarf with the jumpsuit. This is a much softer look than the other one, but I do like both! I loved it in your last post, and I love it still! After a VERRRRRY unfortunate experience in the 70's with a jumpsuit, a four-seater airplane with no bathroom, a weak bladder and a jar, I will never, ever wear a jumpsuit again. That being said, I really like the look on other people. This one is styled to perfection, and you look so, so cool. Still looking good! I like both renditions and you really know how to wear a jumpsuit. If this is your front porch, I'm impressed. This jumpsuit is so unique! I love it and it is you!